Citation: C N Trueman "Sherman DD Duplex"
The Duplex Drive (DD) tank was designed to be used at the D-Day landings. The Duplex Drive tank was meant to give the Allies mechanised armour on the beaches of Normandy – a weapon that would surprise the Germans defending the beaches there, who would have expected only troops in a beach landing as opposed to tanks. 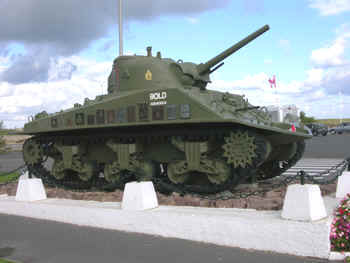 The Duplex Drive tank met with success at Juno Beach but failed to give the Americans the cover they needed at Omaha Beach. The DD tanks were the brainchild of Percy Hobart – a general brought back from retirement on the orders ofWinston Churchill. Hobart’s plan was to land tanks – his ‘funnies‘ – where infantry would most need them – in vulnerable places such as on a beach. With the defenders well dug in at Normandy, the Allies faced the potential of large losses on the beaches if they could not get off them into the relative safety of inland geographical features. The DD was meant to give them added protection. Whereas infantry were vulnerable to machine gun fire – seen so tragically at Omaha Beach – the logic behind the DD was that it could take out a machine gun post and men on the beach could move in safety behind it as it advanced up a beach. The DD was actually a Sherman tank fitted with a floatation skirt that allowed it to ‘swim’ to shore. Tested in coastal conditions in southern England, it could have made a major difference to what occurred at Omaha. The landings at Juno Beach proved that Hobart’s idea was sound. The tank in the photo was recovered from the seabed 27 years after the landings at Juno – a casualty of war. What went wrong at Omaha (where barely any of the 30 DD’s launched reached the shore)? It is now generally thought that the DD’s for Omaha were launched too far out at sea. The crews had trained in the relative clam of waters near the coast in the English Channel. They would not have experienced water pouring into their cabins. The sea was a lot rougher than anticipated when they were launched at Omaha and sea water lapped over the skirts and flooded the tank. The Shermans would have sunk in seconds and the crews, though equipped with breathing masks, would have stood no chance. Lacking mechanised armour support, the American troops on Omaha Beach were pinned down by accurate German machine gun fire and suffered terrible casualties. Hobart’s idea – as with many of his ideas – was relatively simple and potentially very effective. However, to work properly, the DD’s needed something the Allies had no control over – much calmer seas.